This is 1 of 5 flats of onion starts. This one is Copra. I trimmed these and I'm thinking about doing them again. Just curious to see how others are doing. Last edited by DoubleDogFarm on Sun Jan 13, 2013 12:49 pm, edited 5 times in total. Mine are out in the garden! When they got to that size i transplanted them and put tunnel coves on the rows. They are doing great! Thanks for starting this thread! Mine are almost that big, and I didn't know when they could go out. I just got my onion plot prepped yesterday. Someplace said not to plant them out until after last frost but that sounds silly since wild garlic is growing fast out in my lawn and some volunteer onions have been growing in the garden since the snow melted. I have the impression -- not sure why or the source -- that onion transplants can go out at potato planting time. ...whic is NOW for me and I've been trying to get them all planted. onions can handle cold temps, hard frosts and snow for a few days. do not worry about them. the earlier you get them planted the better they will do. the only reason i wouldn't plant is if the soil is frozen solid. I think I have some bad news for you. Yellow Granex is one of the Vidalia onions. 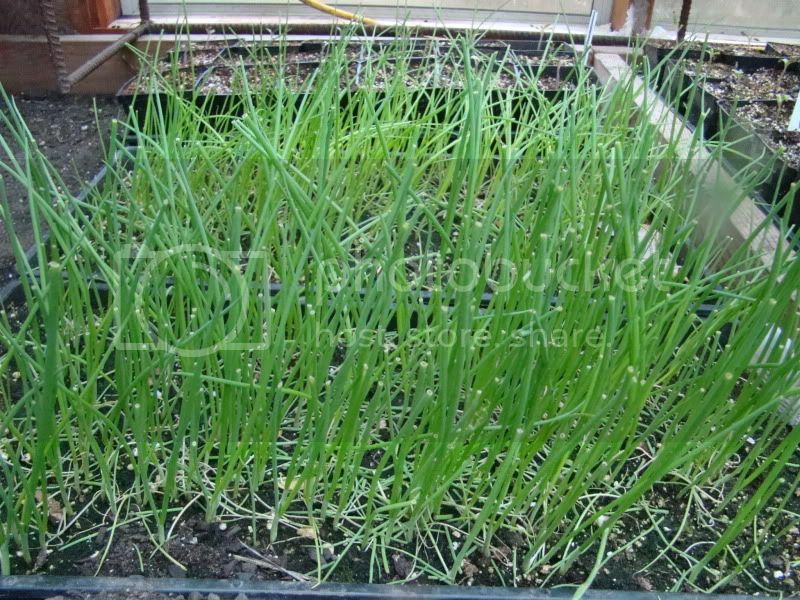 It is a short day southern onion and will quickly bulb up north, resulting in small onions. They sell them here on the seed racks too for some reason. Thanks for the info. Can you recommend a few I should try? How many weeks old are those Onions in your picture? I think I need to start mine earlier... my Onions are not as well developed by the time I want to start getting them into the garden. I found Sweet Spanish Yellow Utah Jumbo on the Ferry-Morse seed rack at Lowes (all of the other onion seeds were more or less wrong for my area--I've taken a lot of seed packs back after looking them up online). Walla Walla is another long day big sweet onion. From what I understand you have to start onion seeds way early, or buy bunches of young onion plants. Last resort is to buy onion sets (little dried onions). Even my local hardware store is advertizing bags of 80 onion sets for $2, It's hard to find bundles of onion plants locally, but it may be possible if you have a good nursery around. Onion sets result in smaler onions that starting from plants, and some of them may bolt to flower/seed. Looking through my photographic memory, looks like I planted them the 7th of February. So much for photographic memory. Looking at my calendar, I planted them on January 29th. They are bunching onions there in the front but those are Walla Walla Sweets behind the sticker. I had just thrown water on them after their 1st day in some sunshine outdoors. I planted the seed about the same time as you did, Eric. They haven't grown as much. They were in the greenhouse from the get-go - which means, before I turned the heat on. They spent a number of nights, covered up on the floor because of fairly serious cold weather in February (hadn't emerged yet). After the heat came on, they started to grow quickly even in the coldest corner. I put them in an unheated plastic tunnel about 10 days ago. They could go in the garden now I suppose but I was a little caught off guard by better weather. I mean, it snowed 2 days ago . They look pretty good to me. If one didn't know, you would think we were grown turf. Well I'm feeling like I'm way behind on a lot of stuff. My repair business is taking off and it rained almost the whole month of March. The wettest March in eleven years. Indoor Onion Starts - Use a Fan? Does anybody fertilize their onion seed starts?